A non-profit animal welfare organization focusing on purebred beagle rescue in the metro Atlanta area. 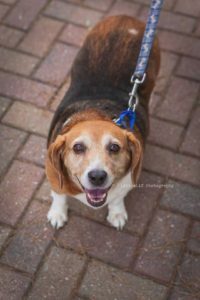 Lottie came to Atlanta Beagle Rescue from Fulton County Animal Services in July, 2016. She was struggling with an upper respiratory infection, and the shelter feared that she had some heart issues. We got her to our vet right away, and it turns out that her heart issues weren’t actually heart related at all. Lottie was so overweight that her trachea was being crushed and she was having a hard time breathing. We enrolled Lottie in Beagle Boot Camp (really just less food and more activity) and got her cleared of her respiratory infection. So far, Lottie has lost 20lbs! She’s still got a good bit more to lose, but she’s doing great. Lottie does have a thyroid condition and will require inexpensive medication for the rest of her life. Lottie gets along great with all other dogs, she’s scared of cats (which is fine and good! ), and she loves, loves, loves all people. She’d be a great addition to most any home! Posted on December 26, 2016 under in Slider | By Michele Harold. Copyright © 2019 Atlanta Beagle Rescue All Rights Reserved.